The Single currency passes the 1.17 mark amid weakness from the greenback. The U.S Dollar began to weaken last Thursday after Trump announced his discontent with the Fed's current policy in regards to increasing interest rates. Trump continued his criticism on Friday by further complaining about the U.S Dollar's strength and accused China and the EU of currency manipulation. Furthermore, he threatened to impose tariffs on all Chinese imports. We believe that the Common currency will continue to be guided by the trade war rhetoric and Trump's comments related to U.S interest rates and the strength of the greenback. For today, we have the release of the U.S Existing Home Sales figure and a higher than expected number might slow down the rise in the Euro. The pair broke above the 1.1700 resistance level while also breaking above the 50-period moving average signaling bullish momentum. 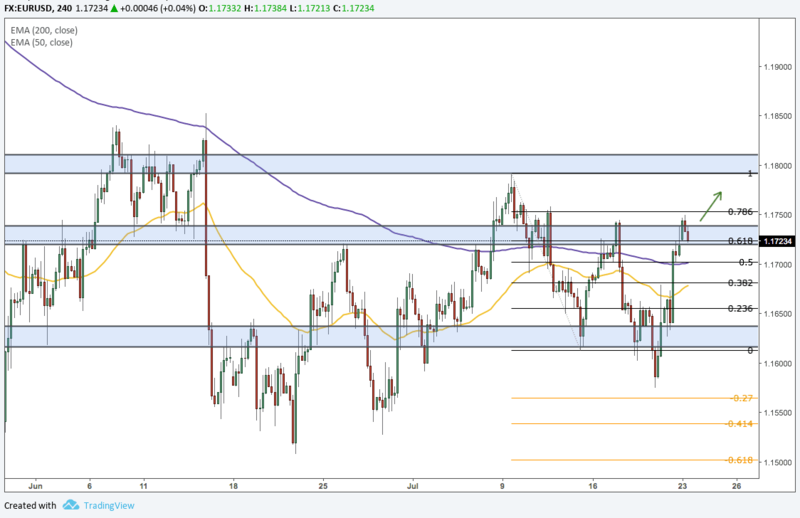 A break above the 1.17240 resistance level will pave the way for a rise towards the next resistance level at 1.17904.